I've been doing a lot of googling lately to collect digital bits about my books & toys. I came across a post by Sue Fisher, curator of the Eileen Wallace Children's Literature Collection at The University of New Brunswick in Fredericton, NB. The collection has the largest research holdings of children's literature in Atlantic Canada. 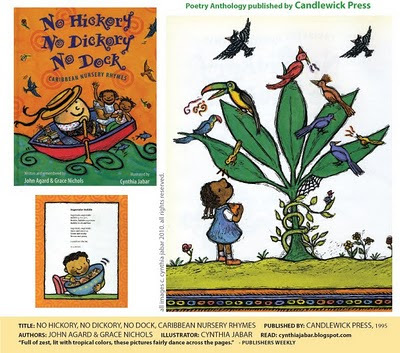 I was pleased to see NO HICKORY, NO DICKORY, NO DOCK, CARIBBEAN NURSERY RHYMES, included in her compilation. 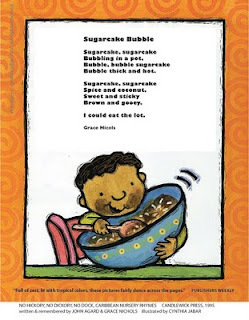 I illustrated this for Candlewick back in 1995, after going to the Caribbean and taking lots n' lots of pictures. (I love my job!) The verse, written and remembered by John Agard & Grace Nichols is a verbal beat box of playfulness. In her 30 days of poetry "cheat sheet," she also includes some of my favorite books of poetry like: Where The Sidewalk Ends, by Shel Silverstein, Alligator Pie by Dennis Lee, and 19 Varities of Gazelle: Poems of the Middle East by Naomi Shihab Nye. Enjoy! 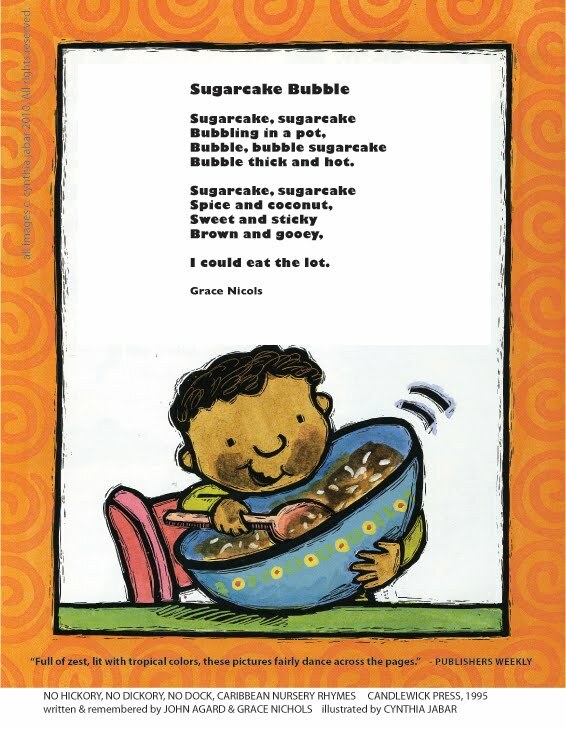 What are your favorite poems to share with kids? 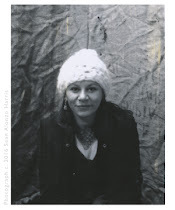 I'm thrilled you found the poetry posts and read them. I think your illustrations for "No Hickory, No Dickory, No Dock" are marvellous. They're so much fun, so playful.